For many people, there is something of a “honeymoon” period right after they’ve finished building their first 3D printer. You’ve got everything working, your printer is nicely tuned, you’ve gotten calibration shapes to come out jus like you want them. Congratulations! Youmagine and Thingiverse have become your favorite websites, and your’e spending hours just looking around for all kinds of free things to turn into plastic to amaze your friends, and possibly even attempt to justify your new hobby to a spouse. Scripting in OpenSCAD doens’t have to be difficult or complex. Eventually, though, you’re going to want to print something that hasn’t been designed yet. One of the reasons you got into 3D printing in the first place was to create little plastic doo-dads. Maybe it was a custom mount for your phone in its case, or a claw to secure a camera to the dashboard of your car. Whatever it is, you need to create it from your own fertile imagination. By now, your calibration object printing experience has taught you that what you eventually need is to have your custom part take the form of a .stl file. The question is, how do you get there? If you’re working in a Windows or an Apple environment, there are a number of choices before you, many of which take the form of a traditional mouse-based CAD program. If, like me, you stick to the Linux universe, or you aren’t willing and able to pay the cost that some of those applications command, there are still some great choices. 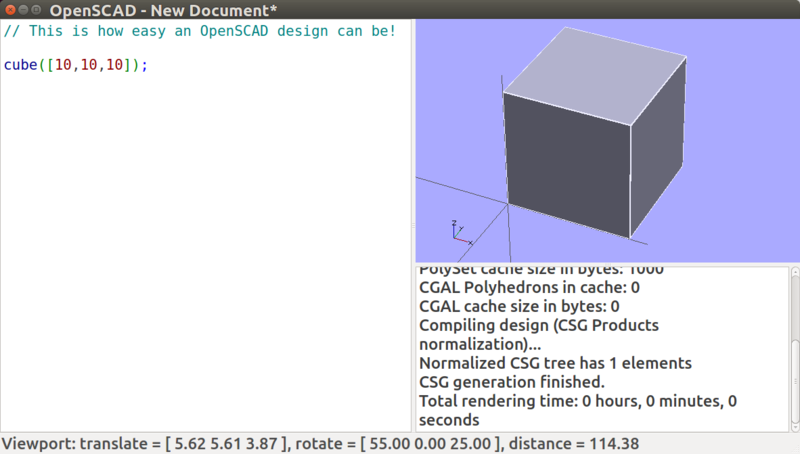 My design tool of choice is the Free and Open Source (GPL v. 2)OpenSCAD, maintained by Marius Kintel. At first glance, this application can seem quite intimidating. 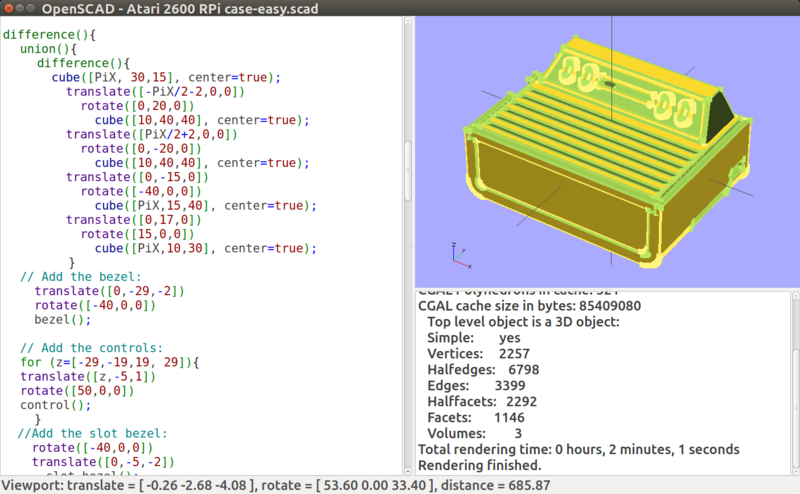 Rather than the usual mouse-based interface, OpenSCAD is more like a scripting language. At first it may seem quite daunting to design a part entirely by writing a program, but like most tools, the more you use it, the friendlier it becomes. 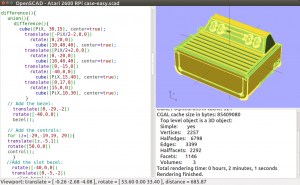 Even if you don’t end up taking to the process, it is worthwhile to become familiar with some of the basics of OpenSCAD, since it is heavily utilized by a great deal of the RepRap community. The printed parts of the Prusa series printers, for example, were designed using OpenSCAD, and the same is true for many other well-known projects. 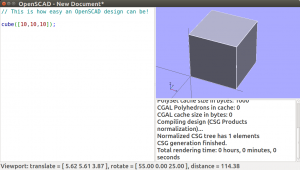 The fact that OpenSCAD is so widely used gives rise to another significant advantage: it is quite simple to modify an existing object in a precise and quantifiable way. If you need a hole to be two tenths of a millimeter larger, for example, you just specify it. Need the hole 5mm higher? Change one value and you’re there. Like most other tools, once you’ve gotten over the initial terror and intimidation, the power and versitility of OpenSCAD really shines through, and believe it or not, it can eventually become easy. It has become my go-to tool for almost all 3D design tasks, and I am confident it will remain an important part of my kit for a long time to come. Once you’ve gotten some of the basics, make sure to check out TheJolly GrimReaper’s YouTube channel. The designer of the Aluhotend has produced some highly effective and educational intermediate videos.